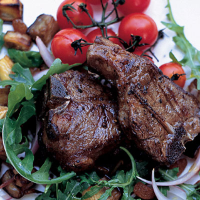 This salad has a wonderful sweet yet punchy flavour – and the lamb chops have a delicious chargrilled flavour. Preheat the oven to 220°C, gas mark 7. Spread out the aubergine cubes on a baking sheet. Scatter over three-quarters of the red onion, reserving a few slivers. Stir together the sugar, vinegar, olive oil and season. Drizzle over the aubergines and red onion, and place in the oven for 10 minutes. Stir the aubergine cubes and add the cherry tomatoes. Return to the oven for a further 15 minutes, until the aubergine is tender and golden and the tomatoes have split but are still holding their shape. Meanwhile, season the lamb chops and grill for 5–7 minutes on each side until nicely browned but still a little pink in the centre. Transfer to a plate and set aside to rest for a few minutes. In a large bowl, toss together the rocket, sultanas and reserved red onion slices. Add the aubergine mixture to any meat juices from the grill pan. Toss lightly together and divide between 2 plates. Carefully arrange the vine tomatoes on the side and top the aubergine mixture with 2 chops. Serve warm.